This is Oskar and Ulani's breeder, Veronique, hugging Oskar's littermate Lucca (Can/Am Ch One Man Band de Guerande TT HOF). Lucca died of cancer yesterday, age 11. I am really sad about it. When I got Oskar, Veronique had held him and Lucca back trying to decide which one she would keep. Oskar was natural earred, Lucca cropped. Otherwise they were very, very similar. I've always felt there was a connection between them, though I never saw Lucca in person again after I went to Montreal to get Oskar. Johanna, I'm so sorry to hear about Lucca. I'm sure Lucca had a wonderful love filled life. The love shows on Veronique's face. Like an email forward said yesterday - no matter what hurts, a dog always makes it feel better. I'm glad you have Oskar and Ulani to help you feel better and know how special our dog friends are to us. Such a beautiful tribute to Lucca, Johanna. I wasn't familiar with that poem and had to look it up. Lovely. 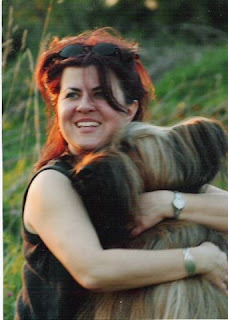 Johanna, sorry about Lucca..great picture...Osk and Ulani are some hairy blessings! !